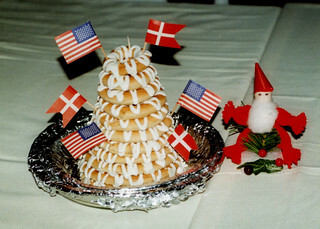 A kransekage ("ring cake") at the Danish Club Christmas dinner in 2002. The dinner was at The Meadows Country Club in Sarasota, Florida. It was given to the lucky Danish Club member who found the almond in the rice pudding dessert (not me). Anne Haubrich baked it. Kransekage is a traditional Danish cake at Christmas, weddings, and other festive occasions. It consists of several pastry rings. The main ingredients are almonds, sugar, and egg whites. It is also a Norwegian tradition (kransekake).